Don't worry. Be happy. Keep learning. : Organize a garage. For the early part of my life, I lived on a farm. 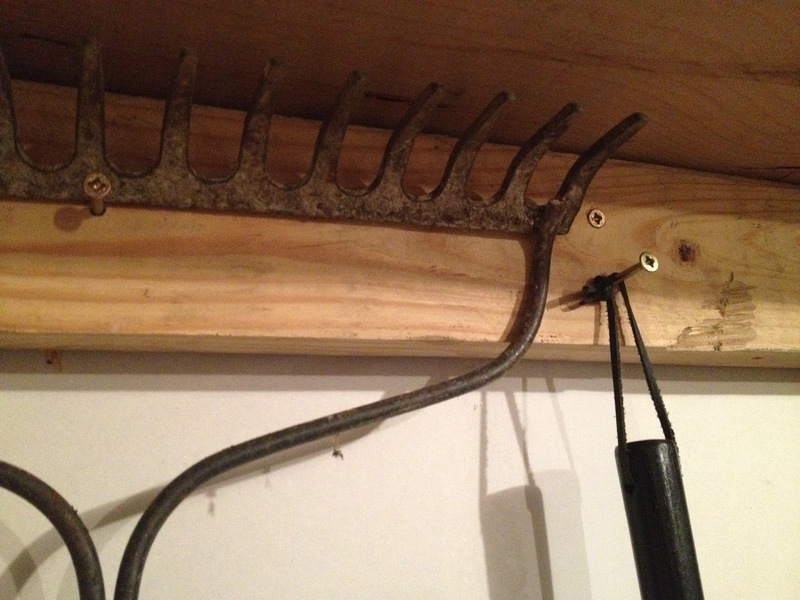 Later I moved into town, but my dad still runs a farm and has an overabundance of unused random things. 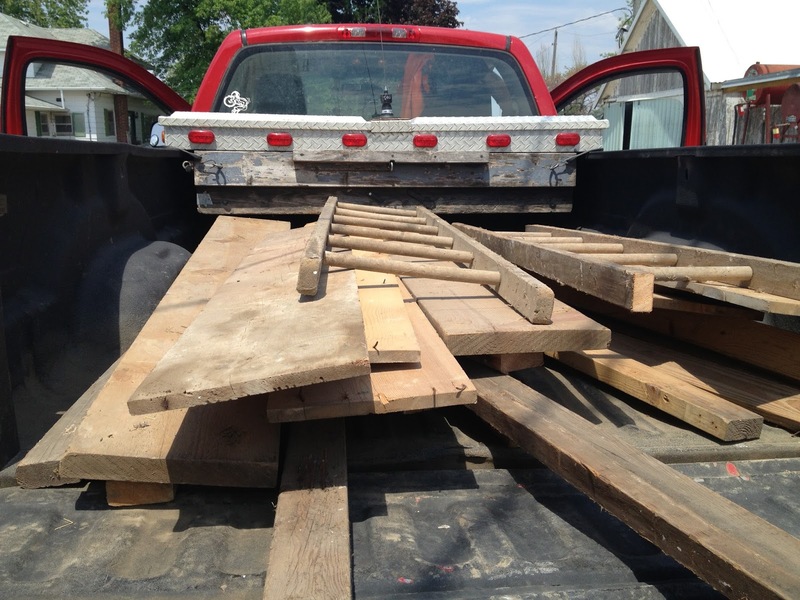 But the best part when it comes to my crazy home improvement ideas is the excess of barn wood that he has! Some is from old torn down buildings, others from old wagons that fell apart, whatever! 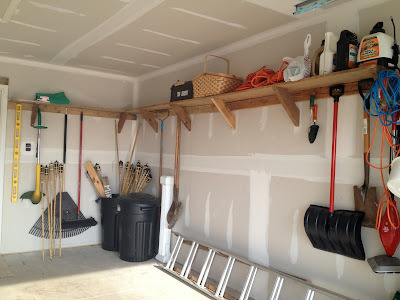 Recently, we decided our garage needed some organization. 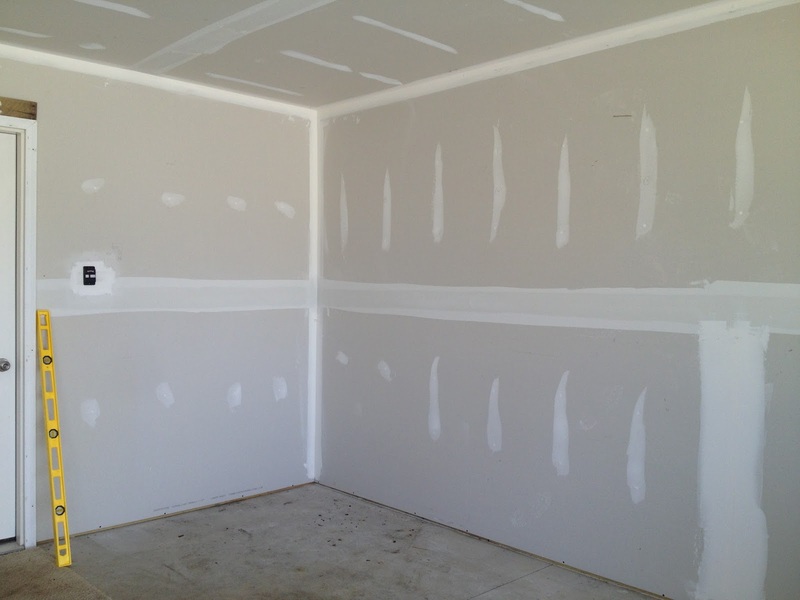 We have a brand new home with brand new blank walls to fill! Once we got back, I borrowed my brother-in-law's hack saw, measured the walls and started to cut my wood pieces. To put it in words sounds so simple, but I won't lie - this was a real workout! I sweat so much! 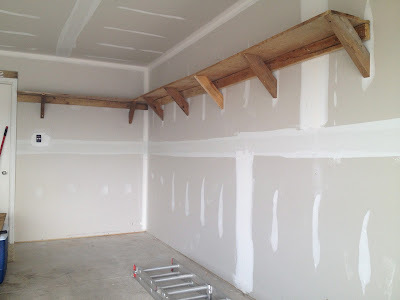 There aren't really "steps" to walk through, so instead I'll just be showing you progress photos as the shelves went up! 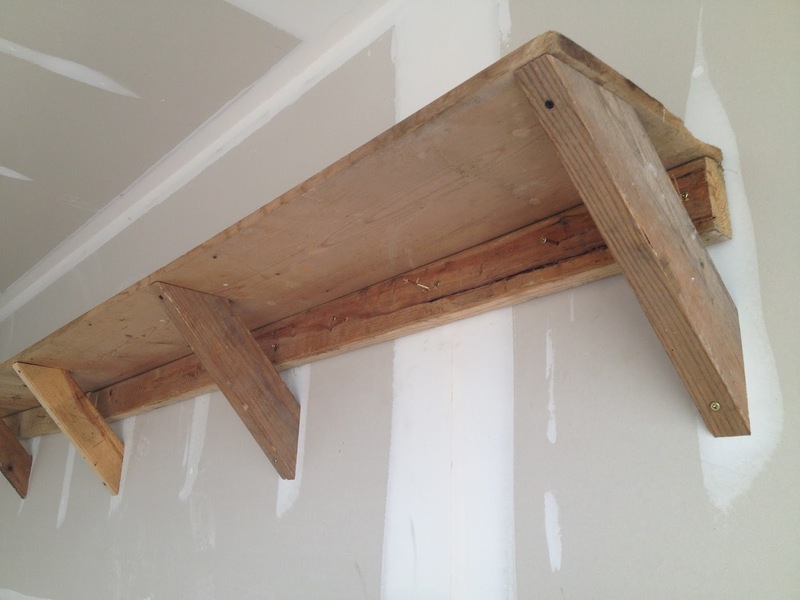 The basic shape of the shelves is a 2x4 with a plank of wood secured on top. I adding the support beams cut at 45' angles. . . The coolest part of using old reclaimed wood is that it's not perfect. 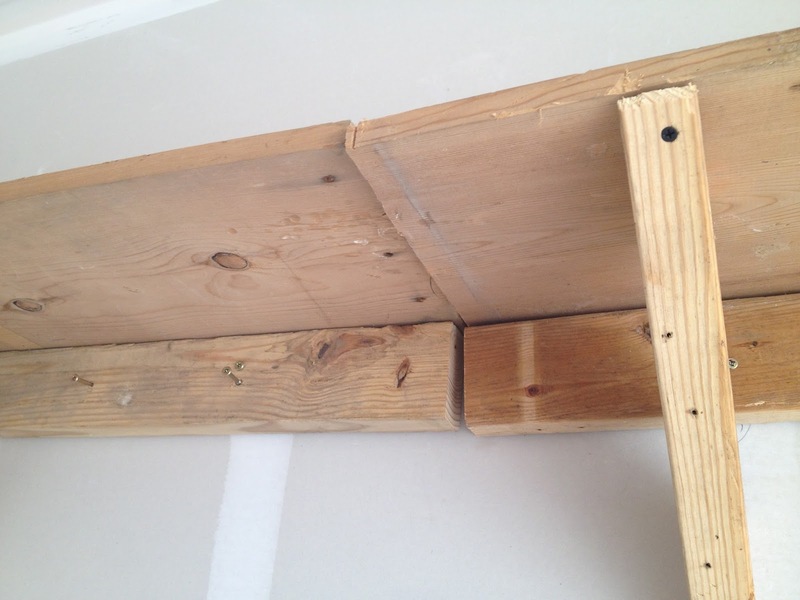 While these shelf beams look uneven or not level, the 2x4s (though mildly warped) ARE level - so it's all good! I'm so pleased with the final result. 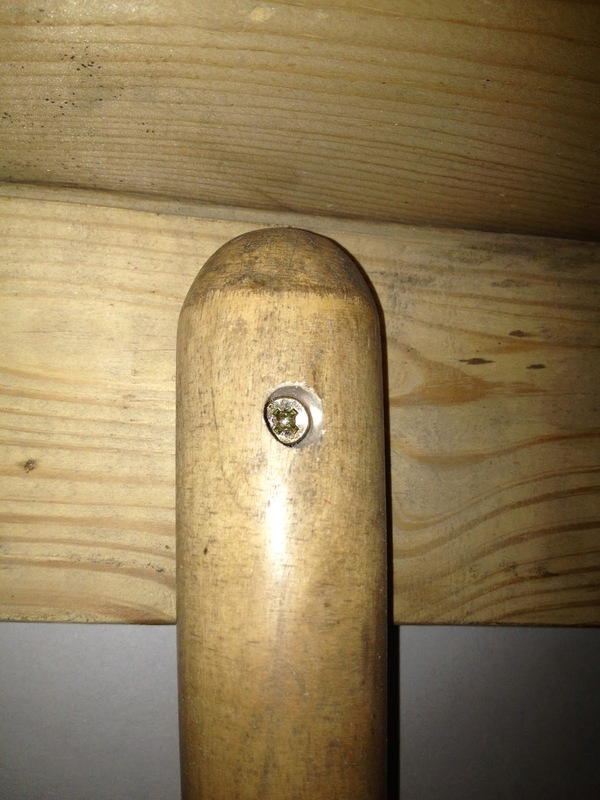 It's simple, but it holds more meaning than any shelf I could have built from wood bought from a big lumber store. And it's OH SO FUNCTIONAL! I added extra screws along the 2x4 beams to hang tools. I even used a 1/2" drill bit and created my own holes in handles so some of the tools would hang on said screws. I felt pretty proud of that idea! I should mention Mike did help me by holding the 2x4 beams level so I could secure them to the wall, but beyond that this was my baby to see through beginning to end. 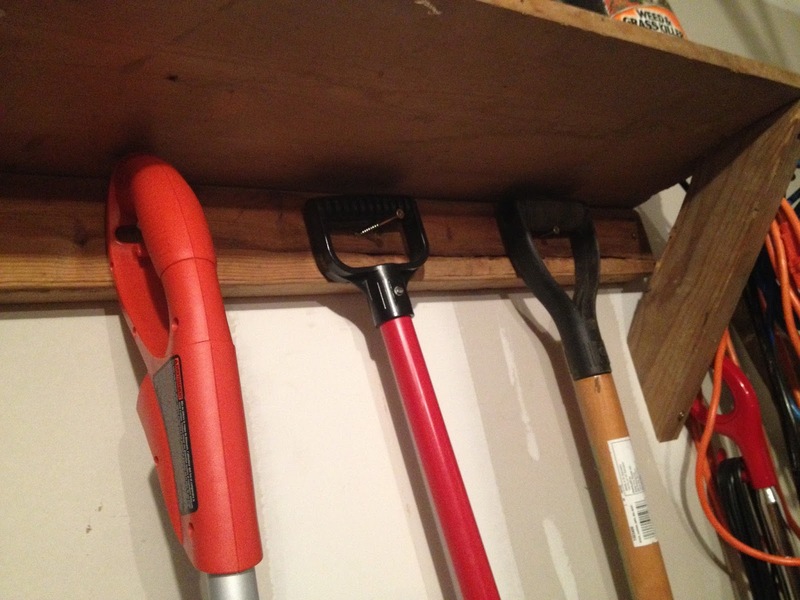 We love having the extra space above to store things and put tools where they should be. at 6:00 AM Topics: Blog., Design., DIY., Handy Tips., Organization. Love this! I've been begging Dan to figure out something with our shop organization. Where to begin? It's so big. I told Mike if we move that I'm disassembling them and taking them with me. I think he thinks I'm kidding. 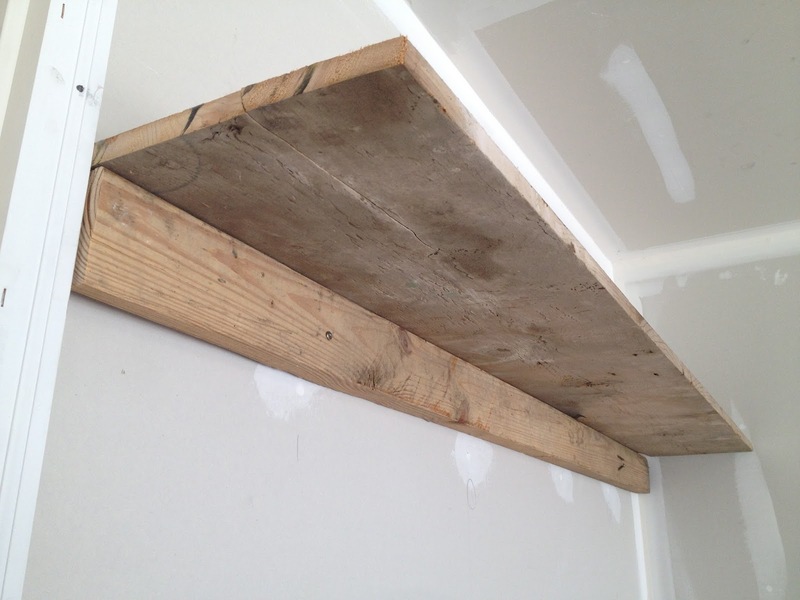 I have been scouring the internet to find the simplest shelf design for the garage. This is the one! I will be putting them up next weekend. For example, it can help your vehicle to climb over some barriers. Learn about Ford Ranger Bumpers: A Comprehensive Guide | Pickup World on pickup-world.com. ome buyers may also produce the error of buying winches without evaluating their specific applications on Uncategorized - Winches Direct. When you would like to outfit your vehicle with aftermarket car parts, be cautious of what you buy on cars voice.